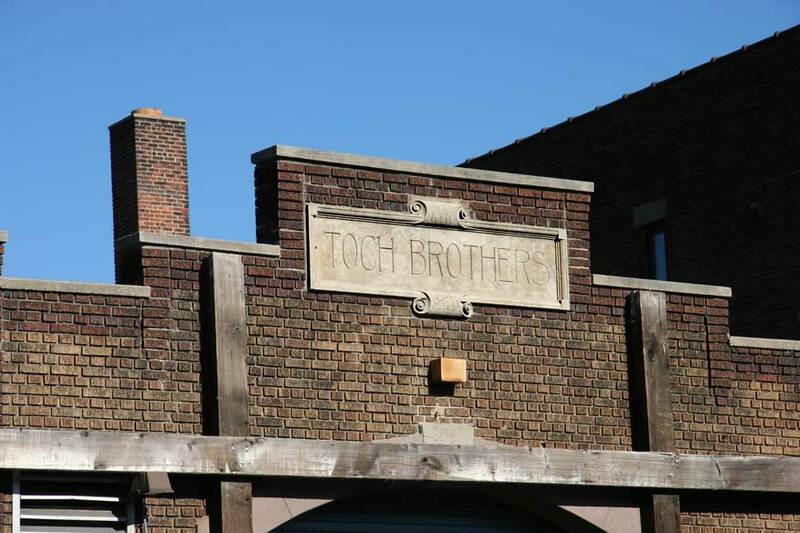 The dates on the Toch Brothers sign refer to their founding (1848) and the date this building was erected (1915). Click here for detail. The address, however, was not 47th Ave. in 1915. Instead, it was 59 9th St. Most of the streets in this area of Hunters Point / Long Island City were renamed some time after 1925. Toch's last listing in the Brooklyn/Queens telephone directory was in 1927. Prior to this location Toch had extensive plants on the northeast corner of 9th St. (now called 47th Ave.) and West Ave. (now called 5th St.). They appear as a prominent feature on a map dated 1908 (updated 1913) in the New York Public Library's Digital Collections. An article on Queens County street names can be found at the Juniper Park Civic Association web site. The earliest Toch in New York was Moses Toch (ca.1824-1884). He is listed in Doggett's New York City Directory, 1850-51, as a glue manufacturer at 189 Orchard St., Manhattan. This business moved to 66 Ave. B a year later, and then to 33 Bowery and 324 Houston St. by 1855/56. By this time they were Moses Toch & Brothers. Moses Toch's brothers were Bernard Toch (ca.1829-bet.1885 & 1900) and Leopold Toch, (ca.1835-ca.1882), and they manufactured (and imported) paint. These three, Moses, Bernard and Leopold Toch, were immigrants from Bohemia, and they formed the original Toch Brothers. All three are found in the 1870 U. S. Census. Moses Toch was the oldest, age 46, Bernard Toch next, age 43, and Leopold Toch the youngest, age 35. All were married and had young children born in New York. Of the children, Leopold Toch's son, Jacob Toch, age 12, was the oldest. In the early 1880s the second generation of Tochs began to move into the business. These were primarily two of Moses Toch's sons, Henry Moses Toch (1862-1933) and Maximilian Toch (1864-1946), and two of Leopold Toch's sons, Jacob L. Toch (1856-1926) and Joseph Toch (1858-1930). "His extended illness had compelled Mr. Toch to relinquish active interest in his manufacturing enterprises, which operate twenty-two plants in Long Island. However, as chairman of the board of the Standard Varnish Works, he went to his office at intervals to preside at directors' meetings. His last visit to his office was in March. In business he was associated with his brothers, Dr. Maximilian Toch and Frank Toch. "He was born in New York on Aug. 4, 1862, a son of Moses and Caroline Levy Toch. After attending high school, he was graduated from the College of the City of New York in 1882." In addition to these details, the obituary describes Toch's interest in religious and educational work. He was treasurer of Temple Emanu-El and for 33 years a director of the Young Men's Hebrew Association. "Mr. Toch derived his interest in Jewish religious school work from his father, who was the first to start the Hebrew free schools in the City of New York in 1868." Maximilian Toch also received an extensive obituary in the New York Times, 31 May 1946, p. 23, reading in part, "Dr. Maximilian Toch of 50 Central Park West, noted chemist and art expert, died on Tuesday of a heart ailment in Wickersham Hospital. His age was 81. "Dr. Toch lectured on organic chemistry at Columbia University in 1905 and 1906 and was the municipal lecturer on paint at City College during 1909. He was professor of industrial chemistry at Cooper Union from 1919 until 1924 and was professor of the chemistry of artistic painting at the National Academy of Design from 1924 to 1936. It was in this capacity that he attracted attention when he began to 'demote' so many of the world's cherished 'Old Masters.'" History and Commerce of New York, 1891, described the Toch Bros., in the following terms, "Toch Bros., Importers and Manufacturers, Varnishes, Paints, Oils, Colors, Brushes and Wood Stains, No. 35 Bowery. - This concern was established in 1848, the founders being Messrs. M. Toch, L. Toch and B. Toch, all of whom are now dead, the business being controlled at present by the sons of the founders. The business consists of the manufacture and importation of paints, fine colors, oils and brushes, the specialty of the house being fine colors and manufacturers' supplies, the firm doing moreover an extensive business in varnishes, oils, wood-stains, mortar colors and lakes... The helm of the business is in control of Mr. H. M. Toch and Mr. M. Toch, the sons of Mr. M. Toch, senior, deceased, the chief founder of the house, as also Mr. L. Toch, the son of B. Toch, deceased." This advertisement for Toch's R. I. W. Damp Resisting Paint dates from 1900 when the business was located on West Broadway. In 1908 the Toch Brothers published a book with the title page reading "The 'R. I. W.' Book; The Damp-proofing and Protection of Modern Building Construction of Every Type Issued on the Occasion of Our Sixtieth Year of Uninterrupted Business in Technical Paints & Varnishes. Toch Brothers; Established 1848. Oldest Technical Paint & Varnish House in the United States of America; 320 Fifth Avenue, New York; Works, Long Island City. 1908." This work is available as a google book at The R. I. W. Book. (R I W stands for Remember It's Waterproof.) This work contains numerous (over 100) photographs of buildings protected by Toch Brothers paints, including the New York County National Bank at 14th St. and 8th Ave. among many other prominent buildings in New York City and elsewhere. This advertisement for Toch RIW Paints appeared in the Catalog of the Fifth Exhibition of the Brooklyn Chapter of the American Institute of Architects, 1905. At that time the business was located at 468-472 West Broadway. Another Toch ad for its RIW paints appeared in the Brooklyn Engineers' Club Proceedings for 1915. In 1915 Toch offices were located at 320 Fifth Ave.
Sweet's Indexed Catalogue of Building Construction for the Year 1906, published by the Architectural Record Co., contains a description of Toch products and services. This work is available on Google Books. The Toch Brothers entry in Sweet’s Architectural Catalogue, 1917, reads, Toch Brothers / Established 1848 / Inventors and Manufacturers of Technical and Scientific Paints, Waterproofing Compounds, Enamels, Varnishes, Colors, etc. / 320 Fifth Avenue / New York, N. Y. / Distributing Agencies in the World’s Principal Cities / Works: Long Island City, N.Y., London, England, and Toronto, Canada. The Toch Brothers entry in Sweet’s Architectural Catalogues, 1933, reads, Toch Brothers Inc. / (Established 1848) / Technical Paints, Waterproofing Compounds and Allied Specialties / 386 Fourth Avenue New York, N. Y. / 260 Federal Street Chicago, Ill. Products included Inventors and manufacturers of Steel Protective Paints; Damp-Proofing and Water-Proofing Paints and Compounds; Caulking and Pointing Compounds; Masonry Paints; Concrete Floor Coatings; Insulating Paints; Smokestack Acid and Alkali Resisting Paints; Roofing Paint; Enamels; Stone Backing; Wood Floor Preservatives; Mortar, Cement and Plaster Colors; Decorative Paints for all purposes. This advertisement from the Architectural Record, Vol. 34 (1913) shows the Joshua Green Building in Seattle, Wash., where the Toch Brothers supplied paint for "Dust-Proof Decorative Treatment for Cement Floors." Another Toch enterprise, Standard Varnish Works, advertised in the same issue. The Standard Varnish Works Factory Office Building at 2589 Richmond Terrace, Staten Island, NY, was designated a New York City landmark in 2007. It was built between 1892 and 1893. Standard Varnish was founded in 1870 by David Rosenberg, whose family became allied with the Toch family at a later date. An advertisement in Young Men, Vol. 39, issue 4, 1914, claims a great deal of Toch paints were used at New York City's Pennsylvania Station. A similar advertisement in the Catalogue of the Twenty-Third Annual Exhibition of the Architectural League of New York, vol. 23, 1908, lists other New York City buildings and shows a picture of the Metropolitan Insurance Co. tower overlooking Madison Square. The Chemistry and Technology of Paints, by Maximilian Toch, Second Revised Edition, 1916, is available as a Google Book. Also available is his Materials for Permanent Painting, 1911, as is his How to Paint Permanent Pictures, 1922. As of Jan. 2010 there was a Toch Brothers website tochbrothers.com, "Est. 1848," but it does not contain any of the history of the company. There was a short article on Maximilian Toch in Wikipedia.